It can be so difficult to know what’s best to use when it comes to bathing your baby. It is so important to know what exactly you are putting on your baby’s skin especially when they are newborn. When our health visitor came to visit us recently she asked how I got Dexter’s skin so soft. The truth was, I didn’t use anything. I liked bathing him in plain old water using a small amount of liquid soap when he was really mucky, which in all honesty, was hardly ever. After reading so much online about the hidden nasties in so many products, I was more than happy to stay au naturel. That was until Good Bubble got in touch. 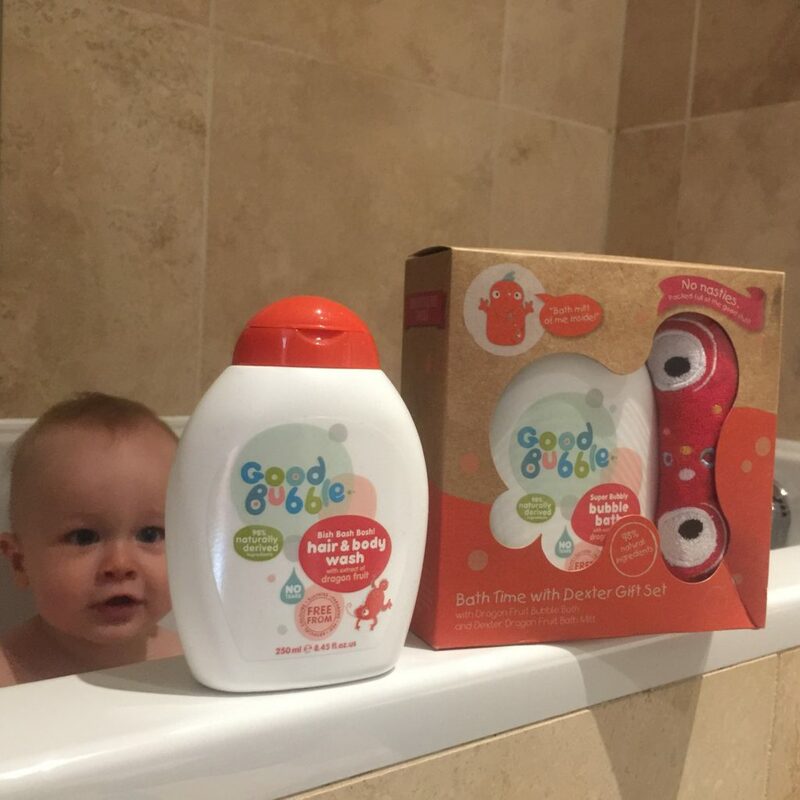 Good Bubble are a British company based in the heart of England who promise to make products which are kind to skin, kind to the planet, safe, honest and good value. 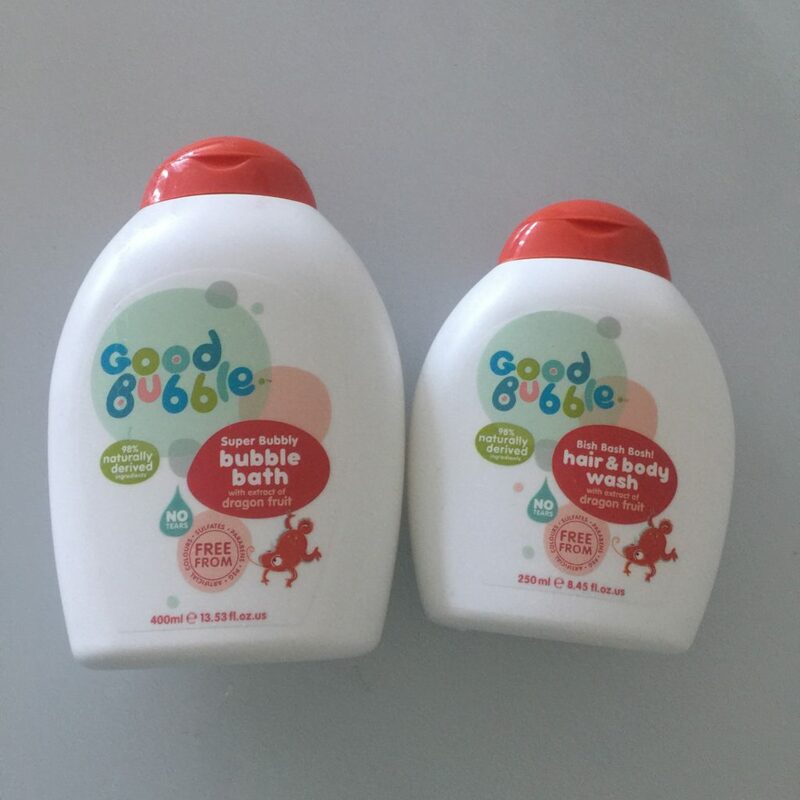 Amy who founded Good Bubble researched that 89% of parents, like me, are concerned about the ingredients in children’s toiletries so set about to do something about it. Good Bubble products are completely free from sulfates, parabens, silicone and artificial colours. They are also vegan friendly and tear free which is amazing news for babies. We were kindly sent the Dexter Dragonfruit gift set to test out along with a couple of extra bottles of hair and body wash and what a match made in heaven the products are for us. The gift set comes with a little Dexter Dragonfruit bath mitt and Super Bubbly Dragonfruit bubble bath and was something so cute and fun for bath time. The bubble bath and body wash is made with real extract of dragonfruit and smells absolutely divine, I’ve even found my husband sneaking a bit to use in the shower. It is so refreshing to find a product for babies that doesn’t contain any nasties while not compromising on quality. 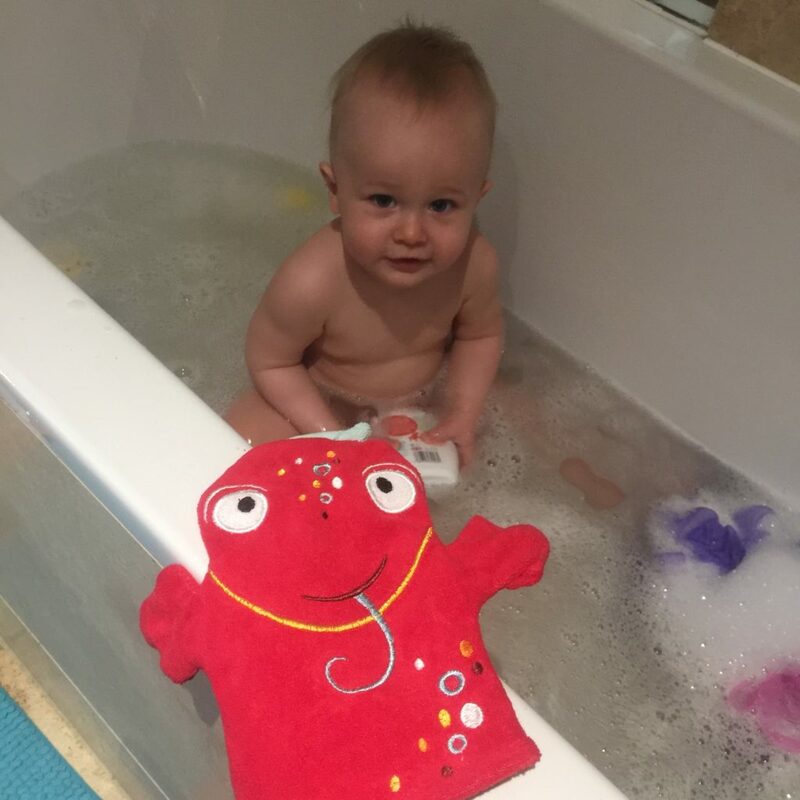 Dexter adores splashing around in the bubbles and getting a good scrub down from the Dexter dragonfruit bath mitt which is lovely and soft. Thank you Good Bubble for making bathtime that little bit more fun. You can purchase Good Bubble products direct from their website. We don’t use products at the moment but I’ve been thinking now he’s outside more (and permanently grubby!) we probably should. This sounds great, I’ve been worrying about dealing with nasties in products so it’s nice to know they’ve already thought of that and made sure it’s free from those. The smell is amazing! It’s scary when you read on the Internet about all the nasties. I’m thankful to have found this product.